I’ve written about Common Core, the over-testing of our kids, and InBloom quite a few times. Yesterday, however, the Capital Region newspaper Times Union, had a front page article that showed that this entire situation was far more rotten than I ever thought. Last month, I wrote about how NYSED and Commissioner John King needed to be held accountable when he shut down some forums because "special interests" (read: parents) got angry about Common Core, over-testing, and InBloom. The Times Union article, however, reveals how the real special interests come into play. There is a part of the New York State Education Department (NYSED) called the Regents Research Fund that a) doesn’t need to play by the same rules as "normal" government workers, b) isn’t comprised of anyone with a degree or background in education, c) isn’t beholden to (or even mostly known to exist by) the general public, d) is paid with money it raises from big corporations and wealthy individuals, and e) has a big say in what educational policy gets set in New York State. Combine all of these and what do you get? Corruption. Big time corruption. These people are raising money and have power over setting educational policy. Pretty much everyone knows how money from companies and legislative power combine in Washington. Company A wants a law written so they "donate" some money to Senator B. Senator B then becomes their champion and pushes the law through. It’s a win-win – if you only count the Company and the Senator, that is. The American people all too often wind up losing in this exchange. Remember that these people are paid with the donations that they gather. The more donations they bring in, the more money they can make. Plus, unlike my Senator example above, they are out of the public eye and don’t answer to the people of New York. If the Senator in my example tried passing a bill that overtly hurt a lot of people in favor of the Company from my example, he could wind up losing his re-election campaign. It doesn’t always keep Senators and Representatives in check, but it’s something. In the case of the Regents Research Fund group, however, this isn’t a problem. If donations have strings attached, like implementing additional testing or setting up a system with potentially disastrous privacy implications, they won’t take the heat when/if their decisions cause a massive backlash. You could fire Commissioner John King and every Board of Regents member, but the Common Core, over-testing, and In-Bloom implementations would continue because the Regents Research Fund would remain. No wonder that Commissioner King and NYSED at times seem not to know exactly what the educational policy of New York State is. During meetings, they’ve insinuated that districts or principals have the final say in these implementations. When asked, though, districts and principals invariably state that this is news to them and they’ve been told that they don’t have any say and must do what State Ed tells them to do. It’s been thought that this was a PR move by NYSED – attempting to shift the blame away from them and towards the local districts. However, perhaps NYSED doesn’t know what educational policy is because they aren’t really setting educational policy. The Regents Research Fund are. NYSED and Commissioner John King might just be the figureheads to be trotted out to the press, public, and politicians and the scapegoats who take the heat so that the Regents Research Fund stays nice and comfortable. Sadly, I think NYSED (and especially Commissioner John King) will continue to use their favorite tactics of denying there’s a problem, blaming everyone else if a problem is proven, and refusing to budge from the course they’ve decided on no matter how many people protest. Moreover, they will continue to allow the Regents Research Fund to be unaccountable, decide educational policy, and take big donations at the same time. 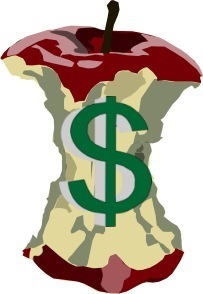 NOTE: The "rotten to the Common Core" icon above is comprised of "apple core" by gingercoons and "dollar symbol in 3D" by vijayrajesh. Both are available via OpenClipArt.org.